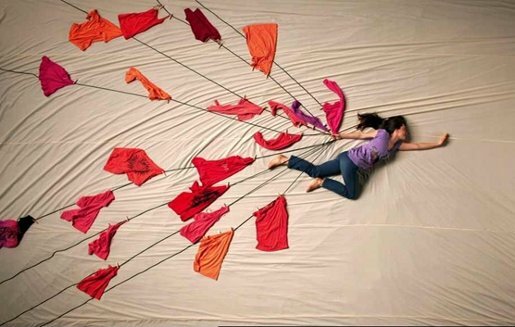 A young woman dreams of floating through clouds of pillows, swimming in water, flying behind a sheet kite, interacting with her younger self and meeting her soul mate. The whole experience is caught in a series of still shots filmed from above, providing a colourful, dreamlike journey of animated visual magic. The Target Colour campaign was developed at The Campaign Palace, Melbourne, by creative directors Gerhard Myburgh and Brent Liebenberg, creatives Jacqui Paterson and Jessica Harold, agency producer Fiona Gillies, account manager Jayne Driver, Georgie Brown and Laura Bathurst, marketing analysts Belinda Symes and Marianne Kevric, digital account service manager Goran Majstorovic, digital producer Nikki Bannatyne, digital creative director Nitin Mistry, developer Igor Almeida. Filming was shot by director Dael Oates via Prodigy Films with director of photography Peter Eastgate, executive producer Jonathan Samway, animator designer Matt Doug, animators Lewis Morley and Brian Carlin. Editor was Adam Wills. Oates described the intense production and six-day shoot as physically challenging, having to place actors and props very specifically on the 6m x 4m “canvas” to get the perfect shot for each 45-second frame. Then, having to move everything just enough, in a very short period of time, so no movements are skipped or forgotten. Post production was done at Animal Logic. The music is “Everything & Everyone” by Boys & Girls, a side project for Marc Bianchi of Her Space Holiday fame. Lead vocalist Annabel Feeney is joined by Ann Yu from Love Like Fire, Tracy Uba from Sugao, Matthew Shaw and Nick Andre from City Light. Sound was mixed at Nylon Studios, Sydney.